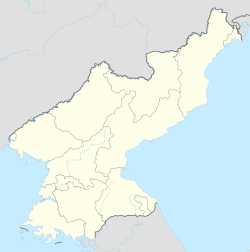 Namyang Workers' District (남양로동자구) is a town in Onsong, North Hamgyong, North Korea. It lies on the Tumen River and opposite to the city of Tumen that stands in the Chinese bank of the river. General look on the Namyang Workers' District from the Chinese side of the river. Most of the movement in the town is made by trucks and bicycles. The town is also served by Namyang Station on the Hambuk Line of the Korean State Railway. A road and a railroad bridge connect Namyang to Tumen across the river in China. Google Earth images show a new, larger bridge under construction as of September 2018. "Namyang". TRIP-CITY.COM. Archived from the original on 2007-10-09. Retrieved 2013-03-12.